Help your skin glow from within, with Glutasome®! Made from pure and natural ingredients, Glutasome promotes healthy skin, helps diminish signs of aging, defends against environmental toxins, and more! 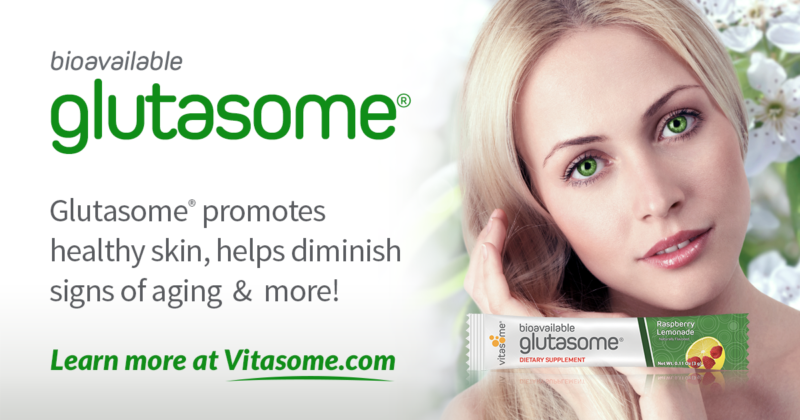 Glutasome® unleashes the incredible power of L – Glutathione (GSH) in a naturally delicious, lemon-raspberry drink. Just mix one sachet of Glutasome® with 8 to 10 ounces of water and shake it until dissolved. 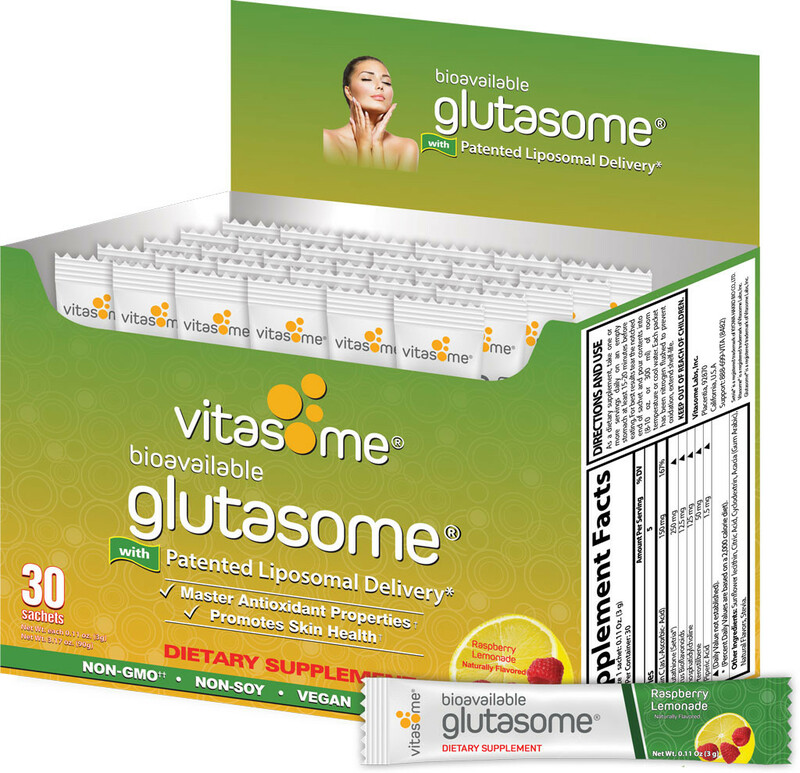 Glutasome® is made with pure and natural ingredients promotes healthy skin, helps diminish signs of aging, defends against environmental toxins, amplifies antioxidant activity and supports healthy immune function. Have your products automatically shipped and Save!! L – Glutathione is a naturally occurring tripeptide of three amino acids that are present in every cell in our body. Produced by the liver, the main function of GSH is to defend our cells against stress and environmental toxins otherwise known as “free radicals” that can interfere with our immune function and adversely affect our overall health. Scientific studies have linked GSH deficiency to a host of autoimmune disorders and even autism. 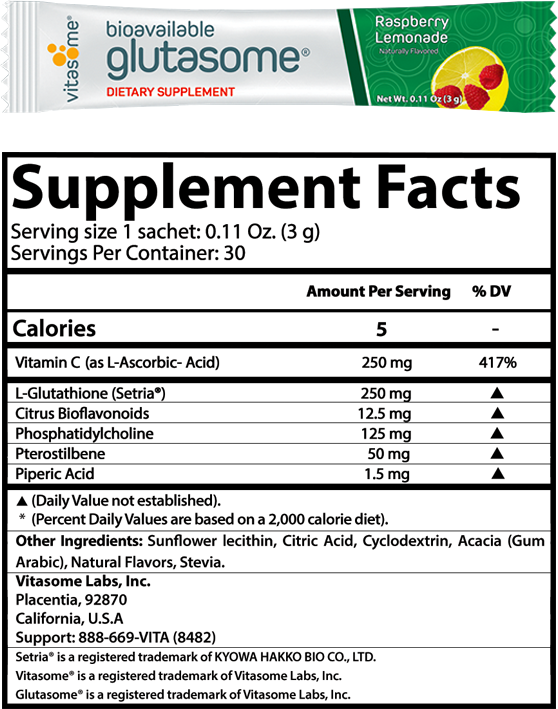 Why should I take a GSH supplement? What’s in Glutasome® and what does it do? Most vitamins have an absorption rate of 10% on average, which means that the remaining nutritional payload is excreted and flushed away. They often have an unpleasant odor and after-taste as well. To solve these problems, Vitasome developed a groundbreaking liposome delivery technology that provides greater absorption, protects nutritional value and increase bioavailability and biocompatibility without compromising quality or taste. Liposomes are microscopic “pouches” that deliver ingredients to your cells. Vitasome’s patented liposome technology encapsulates micronutrients in cell-like spheres surrounded by biocompatible membranes comprised of essential phospholipids that facilitate controlled release of the ingredients at the molecular level and satisfy the body’s desire for phosphatidylcholine (PC), a lipid that supports brain health†. Vitasome’s liposome delivery technology is intellectual property of Vitasome Labs, Inc. and protected under USPTO Patent #9,585,417. † † We do not use ingredients that were produced using biotechnology. As a dietary supplement, take one or more servings daily on an empty stomach at least 15-20 minutes before eating. For best results tear the notched end of sachet and pour contents into (8-10 ounces or 300 ml) of room temperature or cool water. 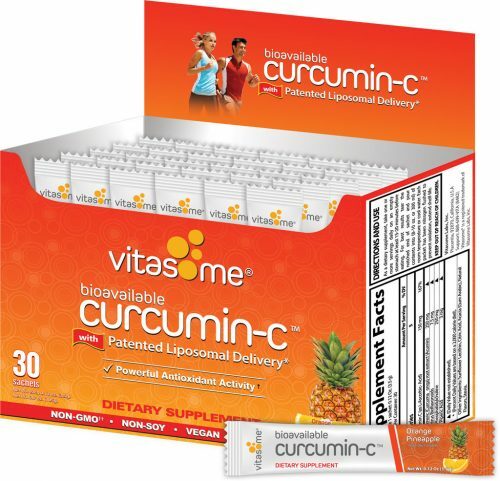 Each packet has been nitrogen flushed to prevent oxidation, extend shelf-life and protect product purity.